Thanks for the quick reply! I’ll keep an eye out - do you typically send out stock updates on your email list? Any news on a double stand for an A4MK2 and a ARMK? And do the PL-2 dust covers still fit after mounting the machines to this kit? Sorry we’ve not got around to looking at stands for the MKII units. Funds are very low right now and i need to buy a second hand unit before designing a stand. Dust covers fit on most of the other stands except the “double” stand for the Digi, and the Rack Converter. The listing’s say whether the dust covers fit or not. Hey there, any updates on the two-tier or even the single unit 45* normal edge? Thank you! Hi! Unfortunately I’ve been badly let down by my supplier a couple of times. It’s a long story so I won’t bore you with it. The single baseplates which are used in the 2-tier and single stands are arriving tuesday. I then need to get them powder coated so I’m hoping everything will be back in stock by the end of the week or early next. I’ll post here as soon as they become available. Thanks so much for waiting! Thanks! Looks like I have to make some decisions today! Woo! Just ordered a 2-tier for the Digi boxes and a 2-tier for the full-size boxes! =) Can’t wait! Thanks for the orders guys! I hope you enjoy using your stands. Post pics! I have a questtion - can you use a 2-tier stand for a 3-tier setup? 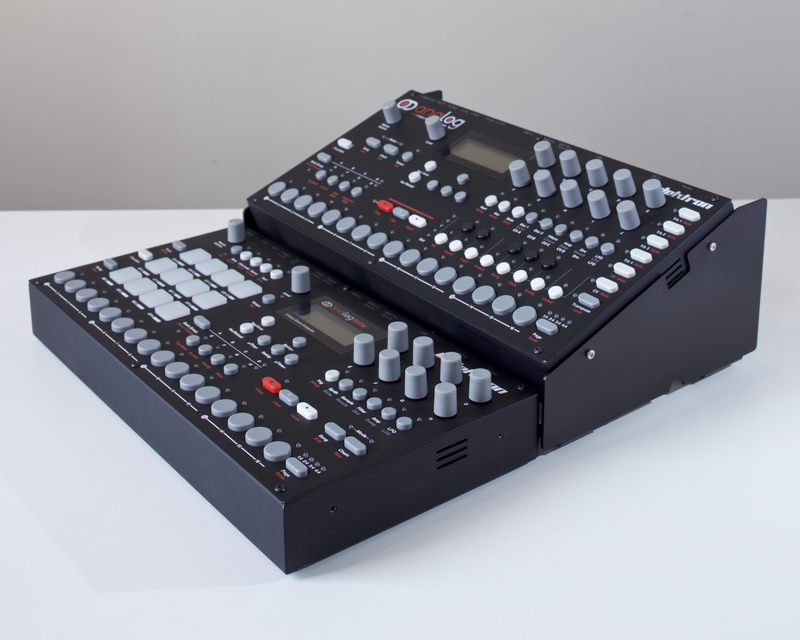 As in, using one elektron in the front without any riser/stand, and then having a 2-tier stand behind it? Is there enough clearance for the cables for something like this? Ye, that should work nicely, there’s plenty of people using a machine flat with stands behind. Here’s a pic of that setup with 20º stand behind (same angle as the bottom tier on a 2-tier stand). You may have to pull the bottom machine forward slightly, depending on the thickness of the cable connectors you’re using. That 2-tier is super tempting…would save me some desk space for sure. So I was saying, that looks ideal for my big box trinity then. Will buy a 2-tier stand at some point, thanks. I take it that those fixing screws are sturdy and wont wear out too fast due to attaching/detatching from the stand?